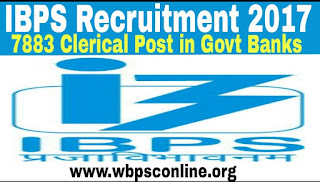 IBPS Clerical Jobs in Govt Banks: Institute of Banking Personnel Selection(IBPS) has issued a notification for recruitment to the post of CWE Clerk-IV in 13 various Govt Banks across India. Online applications are invited from the eligible candidates for IBPS recruitment 2017 through only the official website(See Url Below). Educational Qualification: The candidates having Graduate degree in any discipline from a recognized University/ Institute or equivalent with knowledge of computers are eligible to apply for Clerk Jobs. Also the candidates should have proficiency in regional languages( Written & Spoken) to apply for the said post in various Banks across India. Vacancy: Total no. of vacancies for Clerical Jobs in 13 various Govt Banks across India are 7883. Age Limit: The candidates must have age limit between 20-28 years as on 01.09.2017 to apply for “IBPS Clerical Jobs in Govt Banks” across India. Selection Process: The applicants will be selected on the basis of Online Examination which will be taken in two phases like Preliminary and Main Examination. Application Fees: The applicants are required to pay an application fee of Rs 600/- (For SC/ST/PH candidates Rs 100/-) with Bank Transaction Charges. Online application fee can be made by using Net Banking/ Credit or Debit Cards. How To Apply: Interested and eligible candidates may apply online for IBPS Clerical Jobs in Govt Banks across India through only the official website at www.ibps.in. To apply online for Clerk Jobs the applicants must have a valid email ID. 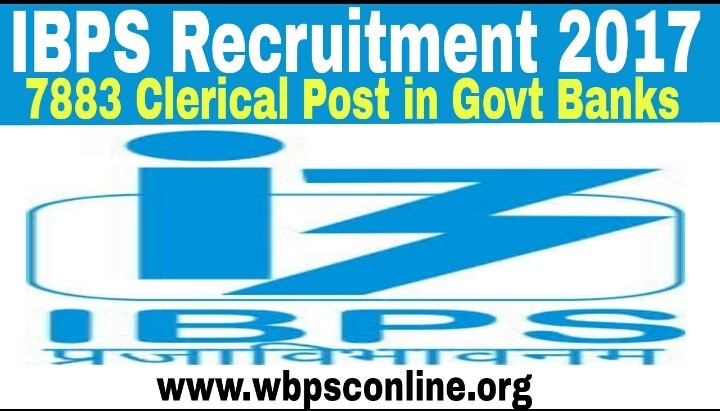 For detailed information about IBPS Recruitment 2017 for Clerical Jobs in Various Govt Banks full notification are given below. Last date for submission of Online Application is 3rd October, 2017.